I was separated from my first wife, after a long a bitter struggle. I only got to see my three-year-old daughter Isabel once a week because I was living alone in almost empty apartment in Jersey City. Back then, Jersey City was still a collection of old brownstones. When I looked out my bedroom window, I could see the statue of liberty out in the harbor. Each night, I drifted off to sleep with the sound of crickets singing in the abandoned lot. It was a wonderful place to be sad. I’d been working in a consulting firm in midtown Manhattan doing something that I was totally unqualified to do, and since I had no idea what I was doing, I got fired. It was the only time in my life I have ever been fired. And get this… I was fired on my answering machine. One night, when I got up to turn off the TV, I had the terrible realization that I had about six friends left, and their names were: Ross, Phoebe, Chandler, Joey, Monica, and Rachel. Things had taken a bad turn. I needed to do something completely new. I needed to get out of Dodge. And that was when I met Glen. Glen was in the Merchant Marine. 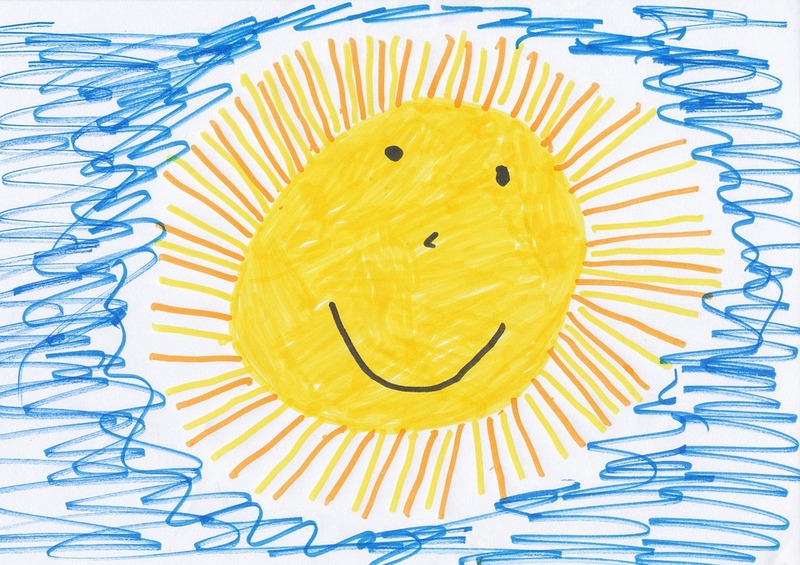 Ask a three-year-old to draw you a picture, and chances are, somewhere in the picture, you’ll find the sun. A three-year-old’s sun is a yell ow-crayon-circle with a bunch of lines coming out of it, pointing in all directions. Can you picture the drawing that I am talking about? I recommend this image to you, this morning, as an illustration of how a good story works. The story itself is the circle part – the sun itself. And the rays that go off in all directions? — these are the story’s different vectors of meaning. A story can mean this, and a story can mean that. The this and the that may complement each other, or they may be completely at odds with each other. And yet both are true. And true for you, the reader of the story. The circle at the center the story that we just heard from the gospel of Luke can be told in this way: Jesus is in a boat with some fishermen. The fishermen have had a bad day. No fish. Jesus tells them to go out again, and when they do, their luck changes! Now their nets are full! The “no fish / fish” meaning points us to the dominant, traditional reading of this story. Like so many others in the New Testament, it is a miracle story. Jesus controls the world in a way that you and I cannot. The fisherman, Simon and James and John the sons of Zebedee, are convinced. At the end of the story, they do what people are supposed to do when they believe. Two weeks after I met Glen, I was standing on a tug boat that was pushing an immense barge filled with scrap metal out of the mouth of the Mississippi and into the Gulf of Mexico. I was an “ordinary seaman” – an unfortunate job title if there ever was one. I was a kind maritime janitor. I didn’t mind the work so much. I could do it. It would have been fine, except for two things. I’d wanted to get out of Dodge, but I hadn’t wanted to leave her! I’d needed to get away, but I’d needed to stay too – beside her. Part of the reason I was out there was to make money to support her, but it was torture, being so far away from her for so long. For that entire month – for thirty days and thirty nights – I was seasick! The memory of it makes me queasy! For heaven’s sake let’s leave this sad tale and get back to Jesus. Once while Jesus was standing beside the lake of Gennesaret, the text says — a crowd was pressing in on him to hear the word of God. He saw two boats there at the shore of the lake; the fishermen had gone out of them and were washing their nets. He got into one of the boats, the one belonging to Simon, and asked him to put out a little way from the shore. Then he sat down and taught the crowds from the boat. It must be a very little way because Jesus can still address the crowds from the boat. It seems improbable that such a thing would be possible in a time before microphones and Public Address Systems. But I’m impatient with readers who fixate on silly details like this and, in the process, lose sight of the text’s greater meaning. I’d ignore it too, were it not for the sitting thing. I notice that Jesus sits in the boat. But it’s worthy of note. Simon and his brothers lived by this rule. You have to keep your center of gravity low. If you don’t, you are in serious danger of capsizing. And capsizing was not comical thing. If you can’t swim, capsizing means death by drowning. So even though Jesus was close enough to shore to talk to the crowds, he still observed the basic rules of his hosts, the fishermen. He kept his center of gravity low. One night, after I was finished washing up the dinner dishes, and mopping the floor of the galley, I pitched the bucket of slop overboard into the Atlantic. I put down the bucket and stood, for a while, looking at the surge of the ocean passing beneath the tug boat. I imagine I lit up a Winston and smoked. Beside me – a mere two or three feet away, was certain death. All I had to do was step out, and I would disappear. Out over the deep, we encounter the certainty of eternity. Let’s set aside the no fish / fish vector of meaning in this story. Let’s look, instead, at the shallow / deep vector of meaning in this story. signaled to his partners in the other boat to come and help. And they came and filled both boats, so that they began to sink. Jesus had been aware enough of the danger of capsizing, that he was willing to sit while they were in shallow water. Now he has orchestrated a miracle in which he is endangering the lives of all the people in two boats! Miracle – even when it offers wealth, also brings fear. They are in deep water! That is where the fish are – but that, also, is where certain death lies. For humans, there is a profound truth here – that encounters with the divine – encounters with eternity – are risky. They take place over deep water. Our greatest desires bring us into the proximity of infinite hazard. And God has enough trust in the resilience at the core of our nature, to know that we can withstand the greatest danger, in pursuit of our fullest life. What is my deep water?